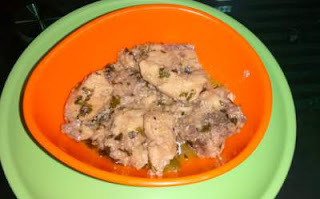 This chicken dish is very simple in the literal sense.There is no much hazard in the cooking process and gets done within no time actually :P It is cooked with very less oil, as the curd marination helps.So there is no much oil or masala,which in turn makes it very healthy too.Do give it a try..
Wash the chicken well and marinate it for 1-2 hours with the following -curd,ginger-garlic paste,salt and black pepper powder. I generally make fresh paste of ginger-garlic,but you can use the ready made ones also. Wash the methi leaves and soak them in water for around 15-20min. Heat little oil in a pan. Put in the chopped onion and chillies. Sprinkle in the methi leaves and let it cook till the chicken gets tender.